Join TOPCA or Renew for 2017! 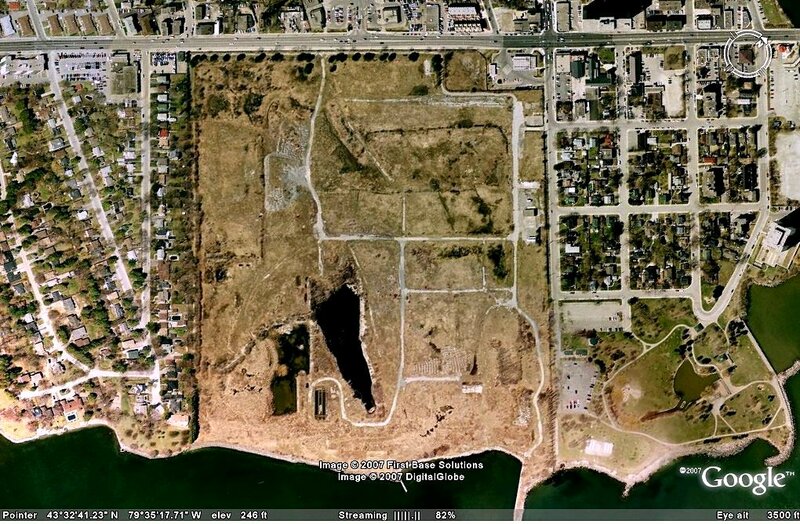 ► View the TOPCA Statement (March 10, 2017) (1p PDF) regarding Public Process at the 'West Village Port Credit' brownfield development site (formerly, Imperial Oil lands). ► View the TOPCA Executive's Letter of Support re WVP (June 24, 2016) (2p PDF) as referenced in the TOPCA Statement (above). 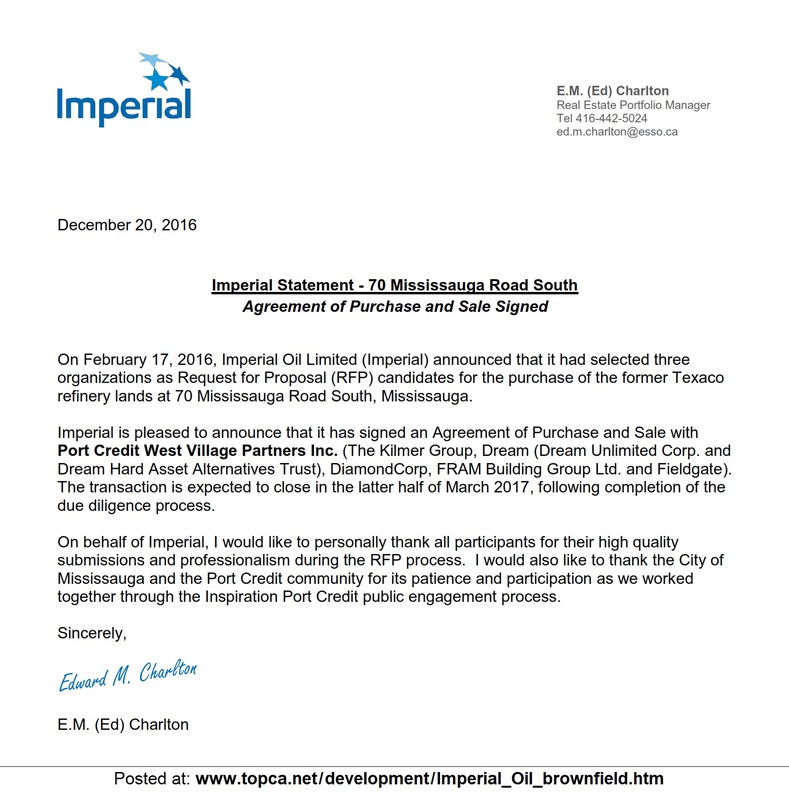 PURCHASE AND SALE OF IMPERIAL OIL LANDS ANNOUNCED: December 20, 2016. Today TOPCA received an Announcement from Imperial Oil regarding the signing of an agreement of purchase and sale for the divestment of their 73-acre brownfield property at 70 Mississauga Road South (aerial map) in Port Credit. This brownfield site has been a major focus of the Inspiration Port Credit public consultation, and the resultant framework document 'Charting the Future Course' (Nov. 2015; see sidebar) was included in the Imperial Oil RFP process. 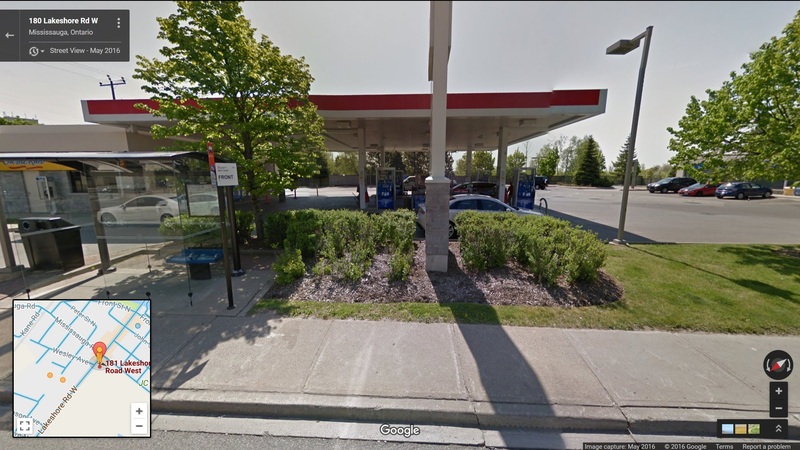 "I can confirm that plans have been put in place to close the service station property at the corner of Lakeshore Rd. and Mississauga Rd. on Oct. 31, 2016 and include the lands, after the service station is closed / decommissioned, as part of the former Texaco refinery land sale, which as you know we have marketed through a RFQ/RFP process. This recent development will not delay the conclusion of the RFP process ... this additional acre of real estate will be guided by the same Land Planning Framework released by the City of Mississauga, as the original 72 acre parcel." 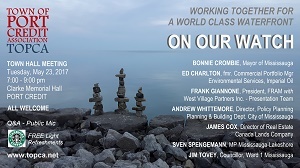 NOTE: Ed Charlton will be updating the Port Credit community at the TOPCA Annual General Meeting on Tues. November 22, 2016 @ 7-9 pm at Clarke Hall. RFP submissions are due from the three RFP candidates by June 30, 2016; however that deadline is subject to change, should good and valid reasons materialize through the course of the RFP period. On the basis of a June 30, 2016 RFP submission date, I expect to spend the balance of 2016 (1) reviewing / evaluating RFP’s, (2) selecting a final candidate to contract with, and (3) negotiate final terms of the agreement with the selected candidate. All of the foregoing is subject to no unforeseen issues occurring throughout the process; however, given the magnitude and complexity of this transaction, there are likely to be some issues along the way. Short answer is Imperial plans to select final candidate by yearend 2016, or possibly the first quarter of 2017. The development of a finalized master plan for the property will begin after the sale of the property (likely sometime in 2017+). All RFP candidates have been asked to develop conceptual master plans that respect the City of Mississauga’s land planning framework for the property, which has received public input. I will leave to Ruth [Marland] to comment on the extent to which public input will be sought re a “finalized master plan”, as that’s outside my subject matter expertise. 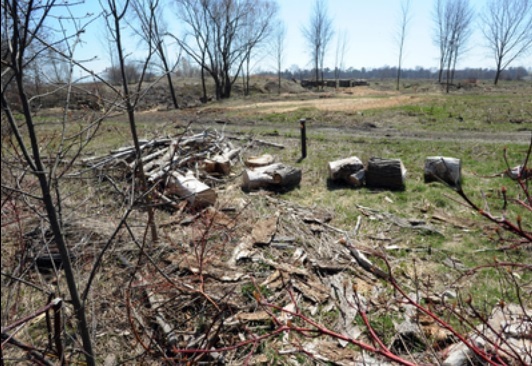 ► Mississauga News article (May 2, 2013): 800 trees chopped for environmental assessment on Imperial Oil lands. Photo by Rob Beintema. 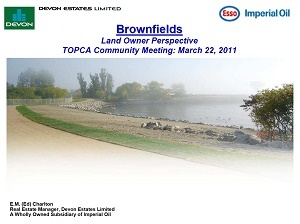 March 13, 2013: TOPCA received the following e-mail from Imperial Oil concerning the tree-clearing activity now being witnessed by neighbours of the Imperial Oil lands (per photo below), a 75-acre long-term brownfield, and site of the former Texaco refinery. 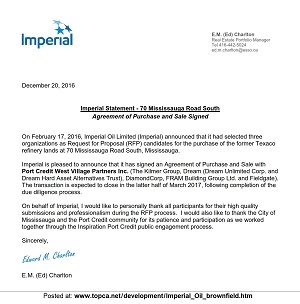 Pursuant to Imperial Oil’s announcement at Nov. 1/12 community meeting, Imperial will be completing a PH II environmental assessment on its property during 2013-14 in support of the City led “Inspiration Port Credit” initiative. 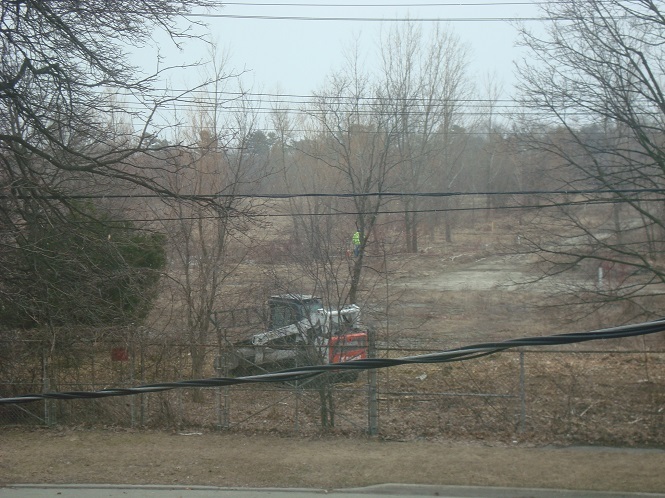 Brush and tree removal is the first step in clearing the property to enable the environmental assessment work to proceed (and ultimately, for the redevelopment of the property). Imperial Oil is supportive of the City of Mississauga’s long-term strategy for urbanized waterfront parks and the company is working with the city in this regard. Imperial Oil will be carrying out environmental site assessment work on its Port Credit South property in 2013-14. The assessment work is expected to last approximately twelve months, after which Imperial will assess required next steps and options available that are consistent with protocols established by Ontario’s Ministry of the Environment. - Test pits and/or boreholes will be located throughout the 72-acre property. Precise locations of test pits/boreholes will be determined on-site as the assessment proceeds, and may change depending on the field observations and analytical results obtained during the assessment. In order to proceed with the assessment work on the property, some trees may be removed to provide access to assessment locations. Imperial Oil is in the process to obtain a permit as required by the City of Mississauga Private Tree Protection By-law, which governs the removal of private trees with a diameter at breast height of greater than 15 cm (6”). To the extent practical, efforts will be made to situate assessment locations away from healthy trees. However, if the need arises to work within the drip line of a healthy tree it will be removed. Questions about the City of Mississauga’s long-term strategy for urbanized waterfront parks are best directed to the City. Please call Ruth Marland at 905-615-3200, ext 5827 for assistance. I believe the above addresses what you’re seeing on the property and the objective of that work (which is the first step toward what will be a much more active site over the next year and a bit, then what the surrounding community has become accustomed to over the past 20 years). If you wish to discuss further, please don’t hesitate to contact me. ► TOPCA's West Village Port Credit webpage continues chronology of this site after sale to West Village Partners Inc. in December 2016. Imperial Oil first presented to the community at the TOPCA Town Hall meeting 'Ramping up the Port Credit Village' in March 2011. ►Click image to see the newly-cleared Imperial Oil brownfield (March 2013). Copyright © 2016 TOPCA - Town of Port Credit Association. All Rights Reserved.